Trying to save money and eat at home more? This menu plan of cheap easy meals on a budget that our family of 6 enjoyed will help! Hey friends! Here’s another menu plan that will hopefully provide you with some ideas for cheap easy meals on a budget! It feels like we’ve been keeping things super simple around here lately, but it’s what is making this season of life work. And while I miss being in the kitchen and being able to have time to experiment with recipes and get more creative there, I know that eventually, that time will come again too! Right now I’m just grateful for the fact that our bellies have been full every day with good food and also grateful that I’ve been able to stick to our budget without too much trouble as well! This one isn’t really a grocery app per se, but I like to use it when I’m at the grocery store to earn points (or kicks as they call them) that I can redeem for gift cards. It only takes a couple of extra minutes and if I’m not pushed for time it’s worth it for me! 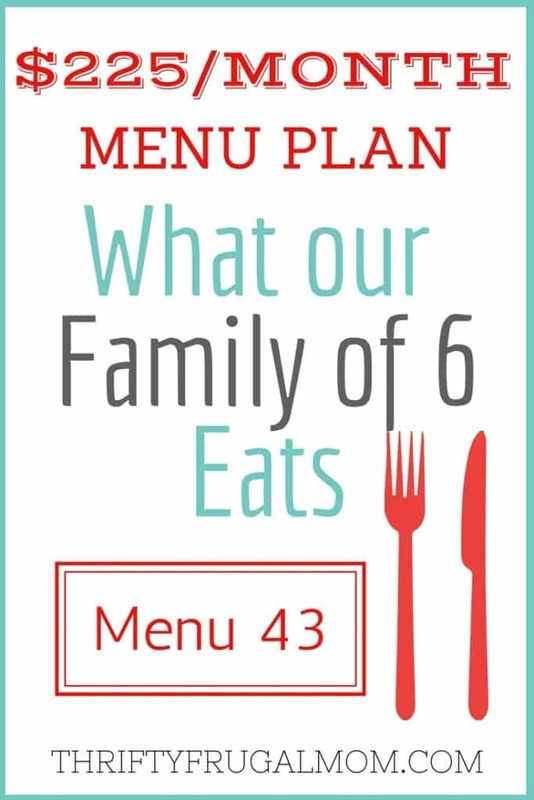 Our family of six consists of two adults with fairly big appetites, a 9 ½ year-old boy, a 6 year-old girl, a 4 year-old girl and a 1 ½ year-old boy. I have a stockpile. My cupboards are full from previous shopping and here’s why. When I can get pasta for free with coupons, I buy as much as I have coupons for. If I’m able to get flour for $0.50/bag like I did last fall, I’ll buy half a dozen and put them in the freezer to use as needed. I do this as much as my budget allows, on as many items as I can and as a result save lots of money. Then when I go to plan menus, I simply plan our meals around what I already have in my cupboards and freezer, as much as possible. Obviously, I still might have to buy a few things at regular price here and there, but by stocking up when the price is at rock bottom I save a lot. – Two friends joined us for lunch. – The chicken and rice dish is a skillet recipe that I found in a simple little cookbook that I have. It’s basically chicken, rice, tomatoes and a few other things that give it flavor. Easy and basic, but quite tasty! – Two other families joined us for the evening. We ate sandwiches before they came and then ate the rest of the food along with some things that they brought as a snack after they were here.